When I realized we would be reviewing the new boy’s accessories from Bugalug, I visited the Bugalug website at www.bugalugbaby.com to take a look at them. The Bugalug website is both cute and easy to navigate, so I quickly found the wrist cuffs and matching belts that I was expecting. The prices are very reasonable, and the pattern choices include flames, skulls, checkers or caution tape…all very “boy” friendly and fun. I’m a Mom to three boys, and I have always felt that the fashion industry caters to girls and often forgets about our little guys. These cuffs are just the thing for boys! 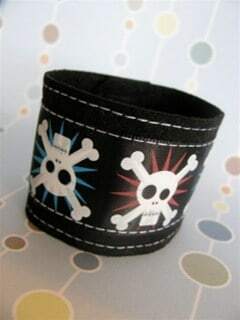 Our medium size wrist cuff and matching cinch belt arrived, in the skull pattern. I showed my two and a half year old son the cuff first and he wanted the matching belt on right away. He was wearing sweat pants and a t-shirt, so the belt went over his shirt, which was not exactly fashionable, but he was thrilled. 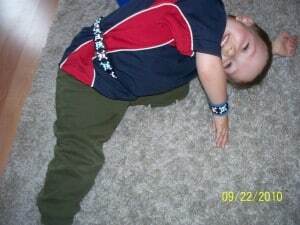 He jumped around acting silly while he showed off his new accessories to me and his big brother. 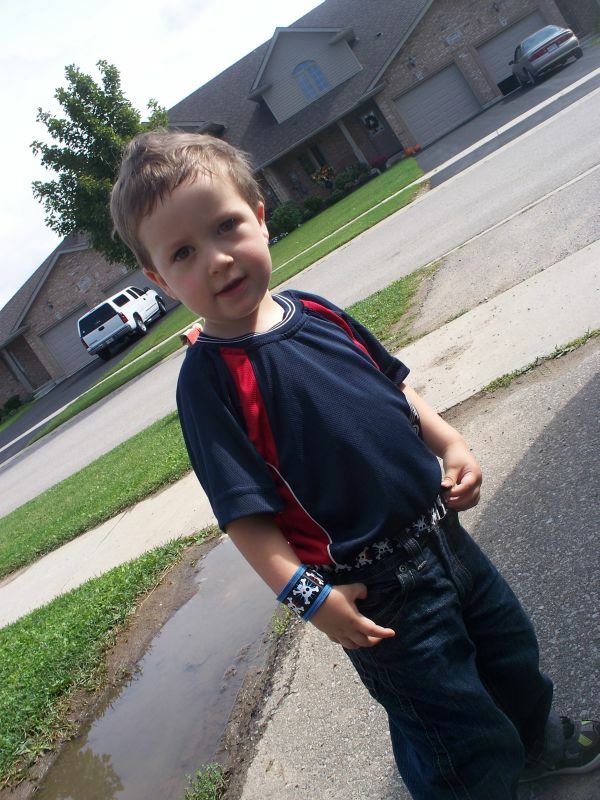 Later that same day, I convinced my little ham to change into some jeans so he could properly wear his new belt, and we headed outside. He showed everyone his cuff and belt, and I eventually had to tuck in his shirt so he would stop showing off his belly and diaper along with the belt. Needless to say, he is thrilled with the cuff and belt. He wears it everywhere and has received several compliments at his big siblings’ school, his day care and at the grocery store. He is one hip toddler now! As for Mom…I am also pleased. The cuff is cute and so easy to put on and take off, that my little man can undo it himself. The belt is cute too and easy to do up, but could be just a little longer to be a really comfortable fit. My only disappointment is the lack of cleaning instructions. Little boys like to get dirty, and it won’t taken long for the cuff to need some cleaning, and the packaging did not include any instructions on how to go about cleaning it. To be safe, I will just handwash it and lay it flat to dry, but instructions would be helpful. This cool kid accessory is made from recycled material, which I think makes it even cooler! 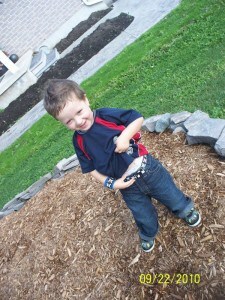 Thanks to Bugalug for remembering our little guys and that they love to accessorize too! I like the cute ponyloops…thanks.. I like the checkered cuff. I like the boys caution cuff! the Caution Cuffs are really cute..er, I mean, cool! I really like there pacifier clips!